The historic ban on openly gay leaders is set to be officially struck down within the Boy Scouts of America after its executive committee voted unanimously on the change late last week. Individual Scout troops will be allowed to set their own policy on leaders, meaning that church-sponsored troops would be allowed to uphold the ban. "This change allows Scouting's members and parents to select local units, chartered to organizations with similar beliefs, that best meet the needs of their families," the BSA said in statement on Monday. "This change would also respect the right of religious chartered organizations to continue to choose adult leaders whose beliefs are consistent with their own." The Associated Press reported that the resolution is expected to be ratified by the organization's 80-member National Executive Board at a meeting on July 27. The change has been expected, with BSA president and former Defense Secretary Robert Gates stating in May that the ban on openly gay leaders was no longer sustainable for the organization, and maintaining it would likely result in a number of lawsuits. "I am not asking the national board for any action to change our current policy at this meeting," Gates told members back then. "But I must speak as plainly and bluntly to you as I spoke to presidents when I was director of the CIA and secretary of defense. We must deal with the world as it is, not as we might wish it to be." He added: "We can act on our own or be forced to act. But either way, I suspect we do not have a lot of time." While the Boy Scouts previously maintained a ban on openly gay youths serving as scouts, that ban was also struck down in 2013. BSA's leaders said in a memo sent nationwide on Monday that the organization "rejects any interference with or condemnation of the diverse beliefs of chartering organizations on matters of marriage, family, and sexuality," highlighting its commitment to granting exemptions for church-sponsored scouts. 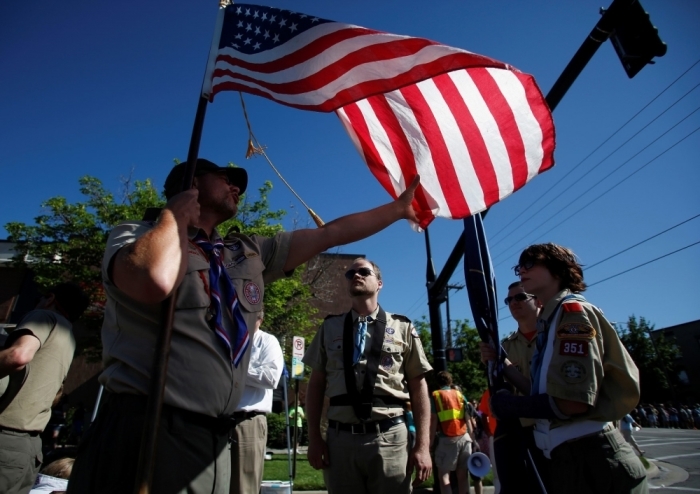 Southern Evangelical Seminary President Dr. Richard Land, who is also the executive editor of The Christian Post, backed the policy that allows exemptions for religiously sponsored units, but said that other concerns remain for boys and girls in scouting. "If you put them in the compromising situations that you are sometimes in with Scout leaders and Scouts, in terms of camping and other situations, it could lead to great tragedy for children," Land said. "It's best to avoid the temptation." BSA has over 2.5 million boys as members, and is one of the oldest organizations of its kind in America, having been founded in 1910. Several alternatives to the Boy Scouts have grown in the past few years, however. Trail Life USA from Orlando Florida told The Christian Post in May 2014 that its "unapologetically biblical" organization was experiencing major growth, in light of several socially conservative groups denouncing BSA's decision to allow gay boy scouts to serve as members. "We don't see Trail Life as being an independent boys group, we see it as being integrated into the life of a church, an extension of the church," Trail of Life CEO Mark Hancock told CP, adding that a "very large majority of our charter partners are churches."